2nd EU state announces it will recognize Palestine as an independent state, following Sweden. Vote expected to pass on Wednesday. Slovenia will recognize the Palestinian Authority as an independent state, the southern European nation’s Foreign Minister told Israel Monday night, despite recent claims to the contrary by the Slovenian president. Last week, President Borut Pahor told AFP he did not expect that a proposal to recognize Palestinian statehood would pass, and expressed his opposition to such a move. On Monday night, however, Slovenian Foreign Minister Karl Erjavec informed Israeli Ambassador Eyal Sela that Slovenian recognition of Palestinian statehood was imminent, Channel 10 reported Tuesday. Earlier this month, the Slovenian cabinet endorsed granting recognition to the “State of Palestine”. 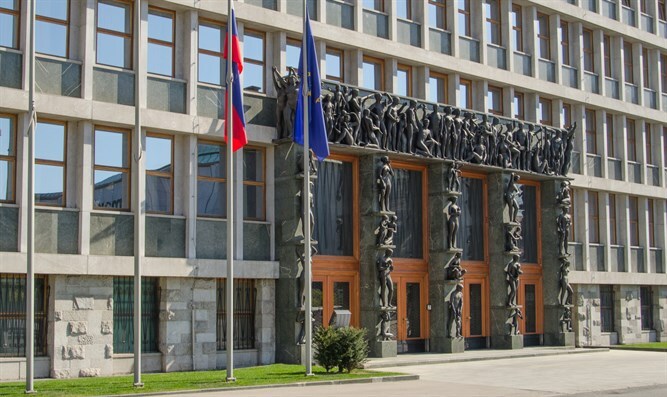 A proposal favoring Slovenian recognition of Palestine, backed by Minister Erjavec, is expected to brought up for a vote by the parliament’s foreign affairs committee. If it does indeed pass, as Erjavec suggests, it will be brought before the full parliament for a vote. Passage of the measure would make Slovenia the second European Union member state to recognize the Palestinian Authority as a sovereign state. In 2014, Sweden officially recognized “The State of Palestine”. "Today the government takes the decision to recognize the state of Palestine," Swedish Foreign Minister Margot Wallstrom said. "It is an important step that confirms the Palestinians' right to self-determination," she said, adding that "we hope that this will show the way for others." Last week, Palestinian Authority (PA) chairman Mahmoud Abbas met EU foreign ministers in Brussels and asked them to recognize a Palestinian state on the pre-1967 territories with eastern Jerusalem as its capital.